Fast growing bump alert! Boohoo recently asked me to style a look for their #WeAreUSA campaign and I couldn’t be more pleased with this curve-hugging bohemian dress. It’s nice and breathable, which is key now that I’ve hit the all-important third trimester mark and easy to throw on with very little thought process required. I wore this for an impromptu mini golf date with B when we totally lucked out and had the course pretty much to ourselves. Kind of nice to have a little throwback-style date night during these last few months when it’s just the two of us :-). Your bump has grown quite a bit! It is so cute! This dress is perfect for maternity and I love your fringed bag! Love seeing a bit of the bump in this dress. SO cute and love the dress! This dress is perfect on you. I love the slits. I am all about non-cotton maxi dresses with slits or unique details. If I can do maternity wear like you someday, I'll be ok. You are my inspiration. Very nice dress! Loving your accessories also! ohhhh girly, you are the cutest thing ever. I just found your blog and I am loving your style! This dress is too cute! 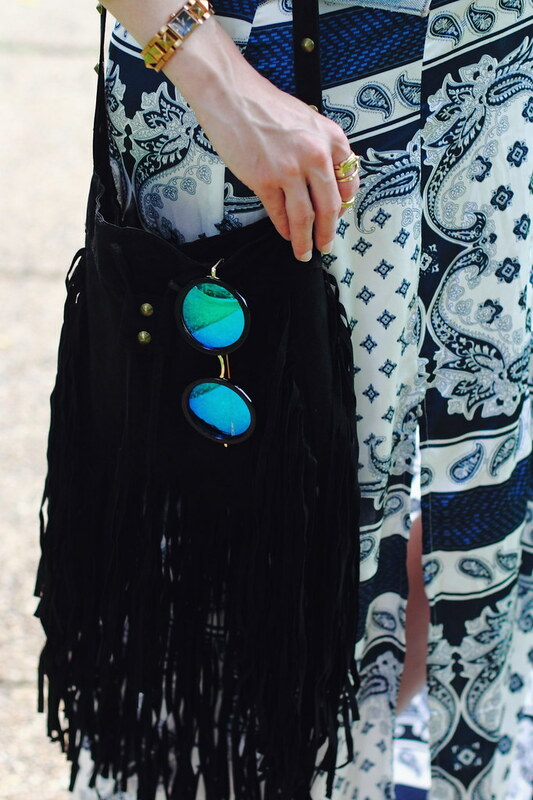 I love it, and those sunnies are AMAZING! the dress is breezy and chic!! perfect for summer! awwww congrats on your soon to be bundle of joy and oh my you are glowing in this boho outfit. You spared no detail love the round shades, the fringed bag, the denim jacket rolled sleeves, the 2 high split of this dress make it come into its own. I love the dress and sunnies! Such great pairing and both are amazing pieces! Beautiful! I love how you can mesh a classic blue and white print with those eye-popping sunglasses and still look so perfectly put together. 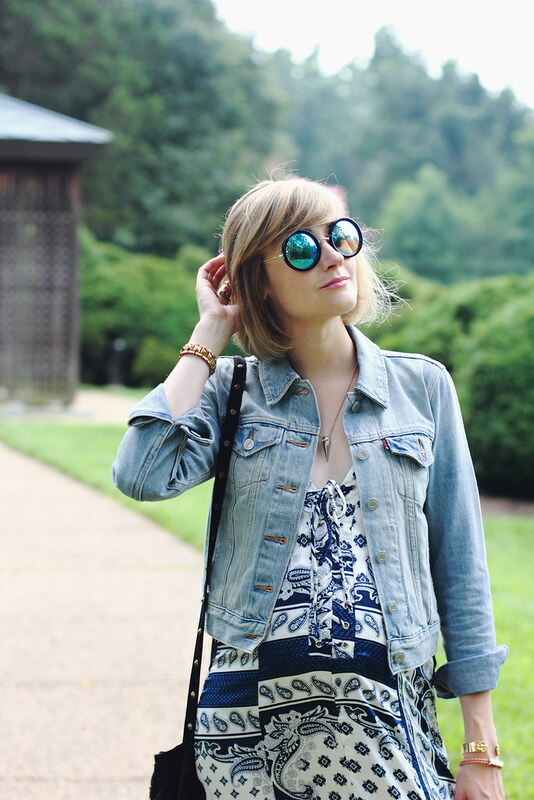 I love a denim jacket over a maxi dress! You look fantastic! 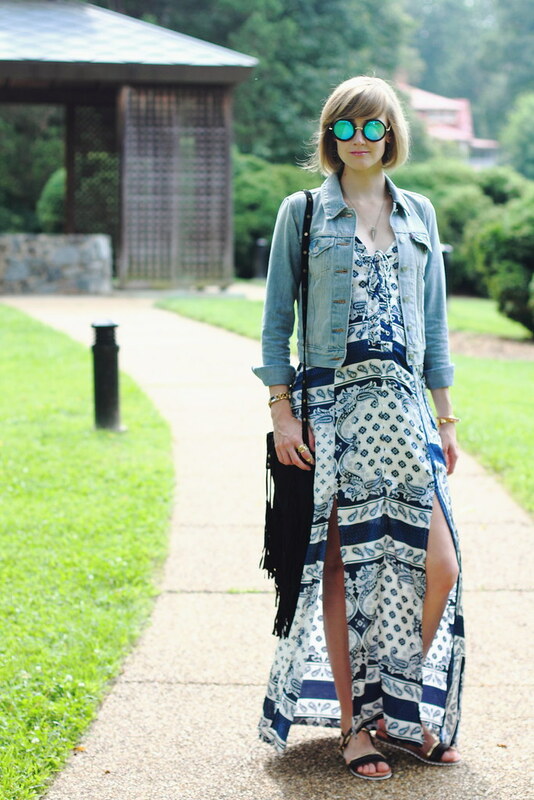 love your maxi dress! wonderful!